When you make a list of your favorite holiday memories, what comes to mind? Driving around looking at the magical light displays, playing in the snow, having photos taken with Santa or drinking hot chocolate and eating s’mores by the fire? 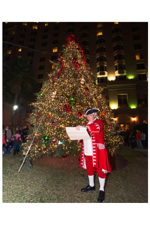 The entire family can make all those precious holiday memories in one stop at the Savannah Harbor Foundation’s 2014 Festival of Lights and Winter Carnival, Nov. 28 through Dec. 28 at The Westin Savannah Harbor Golf Resort & Spa. The five-week event will feature a drive-through, dazzling holiday light show around the Grand Prize of America Road Course, the popular boat parade, Ferris wheel and carnival rides at Bryan Square, the Gingerbread Village inside the hotel and a winter-themed “fun zone” for the kids. The Savannah Harbor Foundation is a 501c(3) non-profit charitable organization designed to support local children’s’ charities and to present family-oriented community events. More than 30,000 visitors made the pilgrimage to Hutchinson Island to enjoy the holiday festivities in 2013, and this year organizers say there’s even more family fun in store. 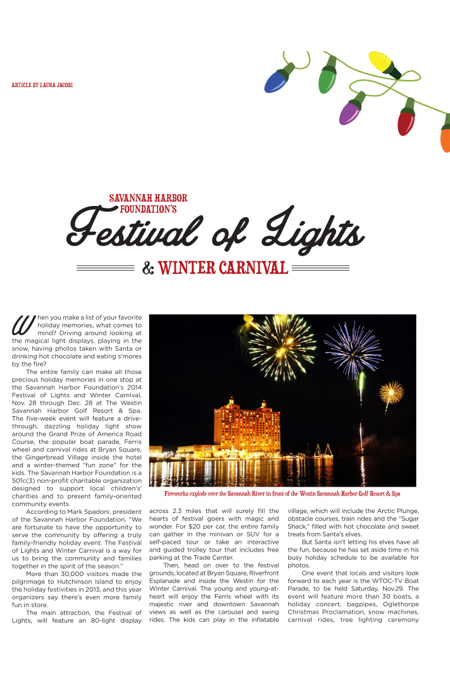 The main attraction, the Festival of Lights, will feature an 80-light display across 2.3 miles that will surely fill the hearts of festival goers with magic and wonder. For $20 per car, the entire family can gather in the minivan or SUV for a self-paced tour or take an interactive and guided trolley tour that includes free parking at the Trade Center. Then, head on over to the festival grounds, located at Bryan Square, Riverfront Esplanade and inside the Westin for the Winter Carnival. The young and young-at-heart will enjoy the Ferris wheel with its majestic river and downtown Savannah views as well as the carousel and swing rides. The kids can play in the inflatable village, which will include the Arctic Plunge, obstacle courses, train rides and the “Sugar Shack,” filled with hot chocolate and sweet treats from Santa’s elves. But Santa isn’t letting his elves have all the fun, because he has set aside time in his busy holiday schedule to be available for photos. One event that locals and visitors look forward to each year is the WTOC-TV Boat Parade, to be held Saturday, Nov.29. The event will feature more than 30 boats, a holiday concert, bagpipes, Oglethorpe Christmas Proclamation, snow machines, carnival rides, tree lighting ceremony and the arrival of Santa Claus! All the fun starts at 5 p.m. and concludes with fireworks at about 9 p.m. 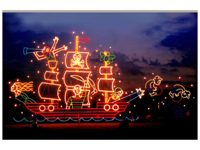 The main attraction, the Festival of Lights, will feature an 80-light display across 2.3 miles that will surely fill the hearts of festival goers with magic and wonder. Other family-fun activities include s’mores kits with stations for roasting marshmallows, snow machines on the festival grounds, an expanded Gingerbread Village with more than 150 entries, a “Frozen” Princess Parade, and a holiday concert series and other local performances on the Savannah Morning News stage. Friday, Nov. 28-Sunday, Nov. 30: 6-10 p.m.
Thursday-Sunday: Dec. 4-7; Dec. 11-14: 6-10 p.m.
Open all holiday nights: Thursday, Dec. 18-Sunday, Dec. 28, 6-10 p.m.